Background: The concepts of aging-related cognitive changes have appeared to be a major challenge in the society. In this context, the present study was planned to find out the functioning of aging population on different neurocognitive measures. Aims: The aim of the study was to find out the neurocognitive functioning, namely memory, verbal fluency, and response inhibition of normal aging population. Materials and Methods: Following purposive sampling technique, a total of 50 healthy subjects (30 males and 20 females) in the age range of 60-70 years were recruited from Jaipur city of Rajasthan. Mini-mental state Examination, PGI memory scale, animal names test, and Stroop test were administered. Results: The findings reveal dysfunction in almost all the domains of memory, namely mental balance, attention and concentration, delayed recall, verbal retention for dissimilar pairs, visual retention and recognition, immediate recall, verbal retention for similar pairs, and visual retention. In domain of verbal fluency, all subjects gave low responses on the animal names test. In domain of response inhibition, all the subjects took less time in color test as compared to color word test on the Stroop task. Conclusions: Findings suggest that there are dysfunction in the area of memory, verbal fluency, and response inhibition in persons aged 60-70 years. However, recent and remote memory were found to be intact. Cognitive functions do decline with age, and attention and memory have been found to be the two cognitive functions that are affected the most in normal aging population;  however, variations exist in age-related cognitive functions in different individuals and domains in terms of susceptibility to the effects of aging. While slowing down of cognitive functions with advancing age is expected, it is important to differentiate normal age-related cognitive functions with clinically significant impaired cognitive functions as in dementia. It could be a majority practice in Indian context to not consult for age-related cognitive impairment, unless it becomes severe and accompanied with behavioral problems. Researchers have consistently noted numerous normal cognitive changes with the older adults such as slowing of reaction time, deterioration of fluid intelligence, and impairment in certain aspects of memory (short-term). Sengupta et al. have found the prevalence of cognitive impairment in 8.8% of the study population that comprised 3038 elderly adults over the age of 60 years from Ludhiana, Punjab. D'cruz and Rajaratnam  determined the effect of aging on cognitive function in a normal nondemented South Indian population using mini-mental state examination (MMSE) as a screening tool. Findings revealed a significant difference between the MMSE scores of controls versus that of the subjects and that there was a significant difference only in the orientation subset which tests recent memory. Results revealed that education had an effect on the MMSE scores. Males had higher scores in the attention and calculation subset and hypertensive subjects had significant differences in the language subset. Although there are several studies ,,,,,,, that validate age-related cognitive impairment; there are few studies, especially in India that profile the cognitive functions in healthy aged population. It is also important to have local normative data when assessing such population for significant change in cognitive functions. Findings of such studies can be taken as reference when assessing similar population at different centers. The aim of the study was to find out the neurocognitive functioning; particularly, domains of memory, verbal fluency, and response inhibition in normal aging subjects. The study was done independently and based on M. Phil dissertation work of the first author. Study design was approved by the concerned supervisor. Informed consent was taken from all the participants. It was a cross-sectional descriptive study comprising single group of normal aging subjects in the age range of 60-70 years. Samples were drawn using purposive sampling technique meeting the inclusion criteria by door-to-door visit. Healthy subjects of both sexes, who gave informed consent to participate in the study, were selected from urban localities of Jaipur city. Subjects with major physical illness, poor eye sight, and organic and psychiatric illness were excluded from the study. Illiterate subjects or subjects with poor understanding of English were also excluded from the study. The subjects were initially screened on MMSE  with a cut off score of 24 to rule out cognitive impairment. Subjects scoring above 24 or above on MMSE were further assessed on the PGI memory scale (PGIMS),  Animal names test,  and Stroop test. The assessment was done in a single session, barring a few cases where the subject requested for another session. This semi-structured Pro forma was prepared by the investigators for collecting sociodemographic details of the subjects. The MMSE is a well-known and widely used test to screen cognitive impairment. Scores range from 0 to 30. A score of 28 is the median for normal octogenarians with more than 12 years of education. Scores below 24 reflect cognitive impairment. The MMSE was chosen as a screening tool for this study not only because it is a familiar and widely used measure, but also because it has been the starting point for many other widely used global cognitive measures. A cutoff score of 24 was kept for the inclusion of subjects. Constructed and standardized on Indian population, the PGIMS is a standard and reliable measure of memory. It has ten different subtests of memory assessment: Remote memory, recent memory, mental balance, attention and concentration, delayed recall, immediate recall, verbal retention for similar pairs, verbal retention for dissimilar pairs, visual retention, and recognition. It was used to measure verbal fluency. It requires the subjects to generate names of animals within 1 min. The total number of the new words (names) generated forms the score. It is a standard measure to assess cognitive flexibility and response inhibition. Sociodemographic data were analyzed by calculating number and percentage. Descriptive analysis of the data was done using mean and standard deviation. Statistical package for social sciences (SPSS for windows version 16, SPSS Inc) was used for analyzing the data. 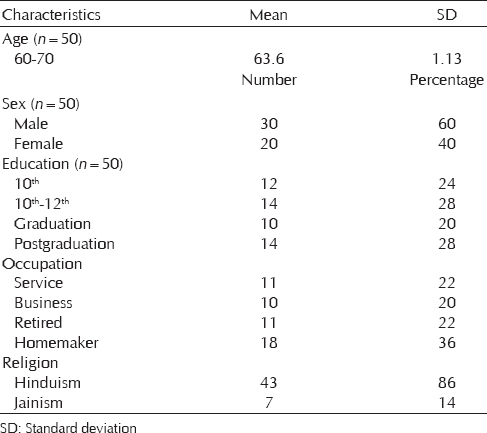 Sociodemographic data [Table 1] reveal the majority of the sample were male. More than half of the samples were at least educated up to the tenth standard. Most of the female subjects were homemakers except two. Considering the time constraint, the researcher could not include more subjects. Screened on MMSE [Table 2], mean score of the subjects revealed no significant cognitive impairment. However, detail assessment reveal impaired performance in specific cognitive domains mentioned hereafter. Findings [Table 3] suggest impaired performance of the subjects on all the subscales of the PGIMS except remote and recent memory. Performance was also impaired on animals name test and Stroop test. The remote memory subscale of the PGIMS measures ability to remember personal events of the past. Results suggest there was no significant dysfunction in remote memory of the subjects. The recent memory scale of the PGIMS measures ability to remember relatively new information. On this scale too, there was no difficulty in recalling any new information among the subjects. The mental balance subscale assesses temporal sequencing. Findings suggest significant dysfunction in mental balance among most of the subjects. It was also found that female subjects showed better performance in the task of mental balance. The attention and concentration subscale of PGIMS assesses working memory as well as mental control. Majority of the subjects showed significant dysfunction in attention and concentration. It was also found that male subjects performed poorly in attention and concentration task compared to male subjects. On delayed recall subscale of the PGIMS that measures verbal working memory, most of the subjects had significant dysfunction. On immediate recall scale that measures short-term memory, mild dysfunction was found among all subjects. Female subjects had a better score on immediate recall. Verbal working memory is vital in execution of daily living activities and tasks, and impairment in this domain could be very distressing for individuals. On verbal retention for similar pairs that measures simple learning ability, no significant dysfunction was found. However, on verbal retention for dissimilar pairs scale, majority of the subjects had impaired performance at dysfunction level indicating difficulty in new learning ability. On the visual retention scale, most of the subjects had impaired performance at dysfunction level indicating deficits in visual-spatial memory. 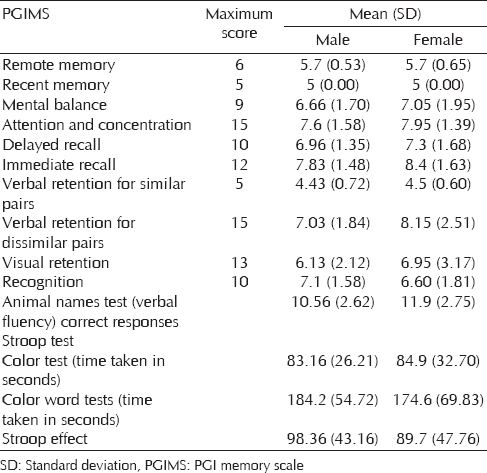 On recognition scale, the results showed dysfunction level of performance indicating deficits in visual and verbal memory among all subjects. In this area, male subjects showed poor performance compared to female subjects. On animal names test, majority of the subjects gave low number of responses when compared with Indian norms from NIMHANS neuropsychological battery  suggesting impairment in verbal fluency and semantic processing ability or word knowledge. On Stroop test, all the subjects took less time in color test as compared to color word test. Impairment in cognitive functions with age is normal and geriatric population is often concerned over their diminishing cognitive abilities as it is related to their daily functioning level. However, it is important to know whether these impairments are uniform across all domains or some domains remain intact. Findings of the present study though suggest impairment in memory functions in normal aging population; it also reiterates that remote and recent memory is generally intact compared to immediate memory in healthy aged population. This is supported by community-based studies in India. Other studies also suggest that remote memory is better in the 60-69 age group than in 70-79 and 80-89 groups. Male subjects living in urban areas, having more than high school education and with college education and living with spouses were found performing better than their other counterparts. ,, This also gets support from the fact that 48% of the subjects were educated above intermediate level. The study findings reveal relatively better performance of female subjects on most of the subscales of PGIMS assessing different domains of memory. Gender-based difference in cognitive function in elderly people has been reported in the studies similar to findings of the present study. Although it is in contrast to studies from India that report males performing better than females in working memory domain. Irrespective of the gender difference, the present study findings suggest impaired temporal sequencing and working memory in healthy normal aged people of 60-70 years. The study findings suggest impaired verbal fluency and semantic processing ability in normal aging. Other studies from India too support significant decline in verbal fluency with aging. The impairment in verbal fluency and semantic processing can have a grave impact on how a person communicates with others, and the person could be at loss of words. This can have secondary manifestations such as people confining to self and withdrawal though not a thumb rule. Impairment on Stroop color naming and interference tests appears to be a concomitant of normal aging  and supports findings of the present study. While it is an expected phenomenon for any individual to show response inhibition as per Stroop effect; the time taken by the present subjects (age range 60-70 years) on the color word test is considerably longer than normal healthy subjects in the age range of 51-65 years. This further stresses the temporal relation of age with cognitive functions and its impact on response inhibition in the elderly population. It was interesting to see that in spite of scoring above cutoff on the MMSE, the subjects showed impaired performance on other domains of memory except remote and recent memory. Overall, the findings of the study reinstate that people with normal aging have dysfunction in the area of memory, verbal fluency, and response inhibition. Maintaining a healthy and good quality of life is of prime importance for aged that has a fair relation with cognitive functions. Age related cognitive impairment is an expected phenomenon and often at risk of being ignored by family members and caregivers. The present study shows impairment in the domains of attention and concentration, verbal working memory and verbal fluency in healthy aged people in the age range of 60-70 years. Although recent and remote memory was found relatively intact in the studied subjects; impairment in verbal working memory was evident and itself can bring disabling impact on activities of daily living of the aged. It calls for the need of early screening and rehabilitative measures for the aged. The study had several limitations though. Considering the time constraint, the sample size was small and may not be very true representative of the population. The subjects were drawn from urban localities of Jaipur city; had a fair educational background and were a single group only. Taking a control group from diverse background could have given better insights. No longitudinal follow-up assessment could be done. Future studies can be done involving larger sample from diverse background comparing with control group. WHO. Ageing: Exploding the Myths. Geneva: World Health Organization; 1999. Crawford MJ, Prince M, Menezes P, Mann AH. The recognition and treatment of depression in older people in primary care. Int J Geriatr Psychiatry 1998;13:172-6. Thompson D, editor. The Pocket Oxford Dictionary of Current English. Oxford: Clarendon Press; 1996. Keith J. Old people as people: Social and cultural influences on ageing and old age. Boston: Little Brown and Company; 1982. p. 1-20. Apt N. Ageing in Africa. Geneva: WHO; 1997. Irvine IE. The Older Patient. An Introduction to Geriatric Nursing. 4 th ed. London: Hodder and Stoughton; 1986. Kennie DC. Preventive Care for the Elderly People. United Kingdom: Cambridge University Press; 1993. Roach S. Introductory to Gerontological Nursing. Philadelphia: Lippincott Williams and Wilkins; 2001. Glisky EL. Changes in cognitive function in human aging. In: Riddle DR, editor. Brain Aging: Models, Methods, and Mechanisms. Boca Raton, FL: CRC Press; 2007. p. 1. Sengupta P, Benjamin AI, Singh Y, Grover A. Prevalence and correlates of cognitive impairment in a North Indian elderly population. WHO South East Asia J Public Health 2014;3:135-43. D′cruz SM, Rajaratnam N. The effect of aging on cognitive function in a South Indian population. Int J Sci Res Publ 2013;3:1-5. Basso MR, Schefft BK, Hamsher KD. Aging and remote memory declines: Preliminary findings. Aging Neuropsychol Cogn 2005;12:175-86. Stokholm J, Jørgensen K, Vogel A. Performances on five verbal fluency tests in a healthy, elderly Danish sample. Aging Neuropsychol Cogn 2013;20:22-33. Lin H, Chan RC, Zheng L, Yang T, Wang Y. Executive functioning in healthy elderly Chinese people. Arch Clin Neuropsychol 2007;22:501-11. Price L, Said K, Haaland KY. Age-associated memory impairment of logical memory and visual reproduction. J Clin Exp Neuropsychol 2004;26:531-8. Salthouse TA. The processing-speed theory of adult age differences in cognition. Psychol Rev 1996;103:403-28. Hedden T, Gabrieli JD. Insights into the ageing mind: A view from cognitive neuroscience. Nat Rev Neurosci 2004;5:87-96. Park DC, Reuter-Lorenz P. The adaptive brain: Aging and neurocognitive scaffolding. Annu Rev Psychol 2009;60:173-96. Pershad D, Wig NN. A battery of simple tests of memory for use in India. Neurol India 1976;24:86-93. Lezak MD. Neuropsychological Assessment. 3 rd ed. New York: Oxford University Press; 1995. Stroop JR. Studies of interference in serial verbal reaction. J Exp Psychol 1935;18:643-62. Rao SL, Subbakrishna DK, Gopukumar K. NIMHANS Neuropsychological Battery Manual. Bangalore: NIMHANS; 2004. Tripathi RK, Tiwari SC. Cognitive dysfunction in normally aging urban older adults: A community-based study. Indian J Psychol Med 2011;33:177-81. Jamuna D, Ramamurti S, Reddy LK. Correlates of Quality of Life among Indian elderly men and women. Project Report submitted Indian Council of Medical. Research (ICMR), New Delhi; 1999. Lalitha K. Psycho-social Correlates of Memory in the Aged. Unpublished Doctoral Dissertation. Tirupati: S.V. University; 2000. Lalitha K. Enhancement of Memory in the Aged: An Interventional Study. Project Report Submitted to ICMR, New Delhi; 2005. Lalitha K, Jamuna D. Memory in old age: Current scenario in India. Int J Indian Psychol 2015;3:88-99. D′Cruz SM, Navin R, Kumar MP. The effect of aging on verbal fluency in South Indians. J Dent Med Sci 2013;6:40-2. Cohn NB, Dustman RE, Bradford DC. Age-related decrements in stroop color test performance. J Clin Psychol 1984;40:1244-50.